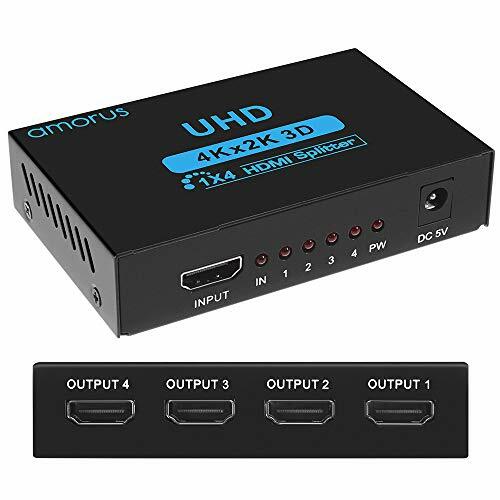 4 Input & 1 Output: Connects up to 4 HDMI input sources to 1 HDMI output for seamless transitions between gaming, television and more by remote control or select button on the item. High Resolution: Support display resolutions up to 4K x 2K@30Hz, Full HD 1080P and 3D. Support deep color 30bit, 36bit, 48bit, per pixel. NOTE: Please make sure your HDMI cable support 4K before you playing 4K signal. Picture-in-Picture Function: The switcher allows 1 main screen and 3 sub-screen displays on 1 TV at the same time. Allow you to switch between the different devices conveniently. 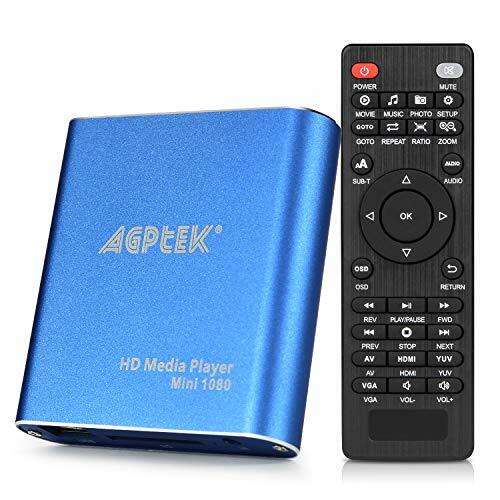 Wide compability: 4 input devices - Xbox, PS3/PS4, Apple TV, Roku, Fire TV, STB, Blu-ray DVD Players and more; 1 output device- HDMI compatible TV, monitors, projectors, and other HDMI displays. Enjoy Your Viewing Experience: Remotely control your HDMI switch with the infrared remote without leaving your comfortable seat. Just plug and play. 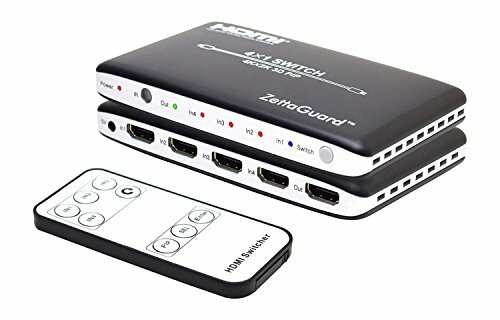 3 Port HDMI Switch - 3 HDMI ports in and 1 out for various HDMI devices, such as Xbox 360, PS3, Beamer, DVB Receivers, Blu-ray Player, Apple TV, Laptop, HDTV/HD Monitor. HDTV 4K (3840x2160P) / 30Hz resolution, HDMI 1.4 Compatible, 3D display supported. 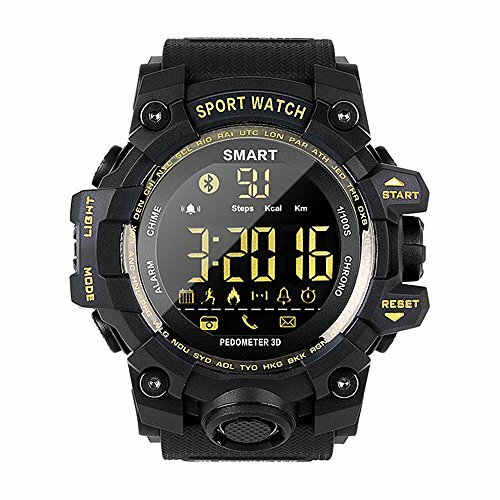 ◆【New Rugged Smart Sports Watch】- New UI design, enlarged FTSN screen, comfortable silicone straps, bring your brand-new experience of sports watch. With IP67 and 5ATM waterproof, EX19 offers you no limitation and flexible wearing experience for all the outdoor activities. Feel free to ware it for running, swimming, hiking, mountaineering and long-time outdoor camping etc. ◆【No charging & Long battery life】- Built-in 220 mAh CR2030 button battery, safe and replaceable. With energy-saving tech. to ensure 1 years working-time. NO CHARGING NEED FOR 1 YEAR. ◆【Smart Sports Tracking】- Integated 3D-sensor to track your everyday accomplishments: steps, distance and calories burned. All the data can be record and managed by professonal APP "Sport+", on which you can setup fitness goals, manage and record your achievment for 21days. ◆【Easy to Use and Full compability 】- To check time, steps, calories burnt etc by simplly press a button. LED luminous backlight. Connects with your smartphones in seconds via bluetooth 4.0 technology. ◆【Multi-functional】- Timely syncs with your smartphone, get reminding of incoming calls , SMS by buzz (or beep). Stopwatch and Camera Remote function is also available, convenient for you to take photoes by pressing a button of watch. 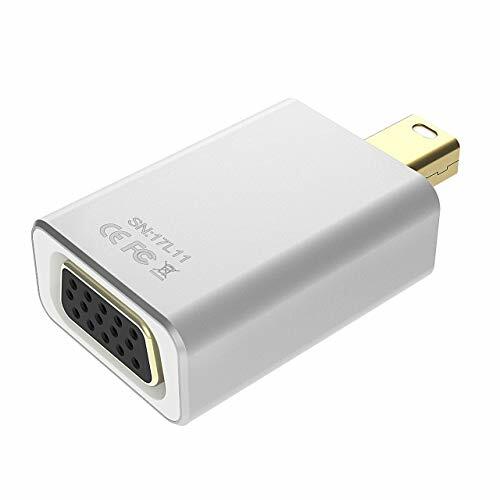 MINI DP to VGA ADAPTER: This adapter could connect devices with the Mini DisplayPort to a HDTV, monitor, and projector that is equipped with VGA port for big screen viewing. A separate HDMI cable is needed (not included). 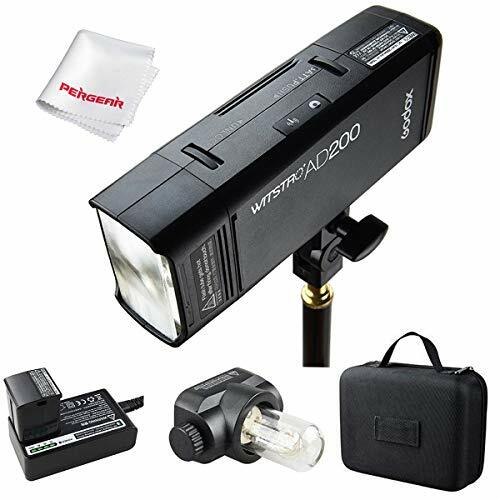 INCREDIBLE PERFORMANCE: Supports resolutions up to 1920x1080 (1080p Full HD) for providing high-definition video and image on your big-screen display. Gold-plated connector can effectively resist corrosion and eliminates signal loss. This ensures fast and steady signal transmission. MIRROR & EXTEND MODES: Under Mirror mode, you can watch movies or play games with family and friends on a perfect big screen. And extend mode allows you to improve working efficiency through split-screen displays. PREMUIM MATERIAL & COMPACT: Adopting aluminum alloy casing, it is not only resistant to interference but also provides better heat dissipation. Moreover, the space-saving design fits easily in your laptop carrying bag to be carried around with you . REMARKABLE COMPABILITY: Compatible with all devices with Mini DisplayPort like MacBook Pro ( before 2016 ), MacBook Air, iMac ( before 2017）, Mac mini, Mac Pro; Microsoft Surface Pro/Pro 2/Pro 3; Lenovo ThinkPad X1 Carbon, X230/X240s; etc. -HD Touch Screen and SIM Supported: With high quality and1.54'' quick touch 240x240 pixel screen,offering you comfortable user experience. 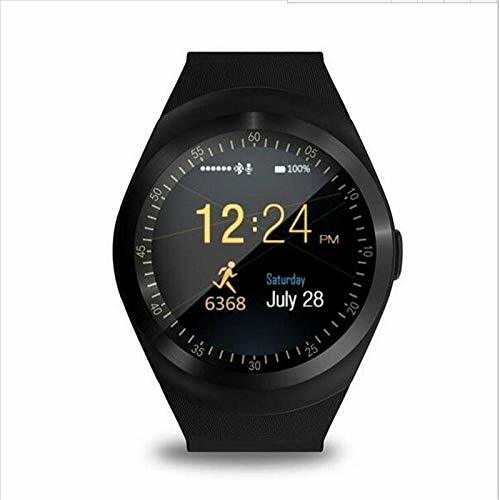 Support micro sim card(only support GSM 2G), you can use android smartwatch independently without your phone or make calls and answer the phone directly when paired with Android smartphones. -Smart Notifications and Fitness Tracking: Support Bluetooth 3.0, Connect your smartphone via Bluetooth, it supports push notifications from Anti-lost, Remote camera, Calls, Message, E-mail, Whatsapp, Facebook & Twitter etc, you can check at all times, any message will not be missed more. Health tracking like pedometer, sleep Monitor, sedentary reminder, you can enjoy sports by recording your total steps,distance traveled, understand your quality of sleep, enjoy your life anytime and anywhere. -Compability with Android & IOS Devices: We try our best to make sure our SmartWatch delivers the best possible experience for both IOS & Android phones but due to limitations of the App Stores can only support full functions for Android devices through the app. For iPhone devices, it supports answer & call, phone book, music play, clock, pedometer, phone anti-lost alert, sleep monitoring, etc. But does not support SMS push, APP Notification, remote camera control. -Product Parameters and Product dimension: The size of the smart watch is 53*45*14.2(mm). Internal Storage: 32M Ram,32M Rom. Battery: 280mAh. (Please make sure the sim smart watch was been fully charged before first use). Languages supported: English,French,Spanish,Italian,Russian,German,Portuguese,Czech and so on, total 13 languages. 【Audio Signals Support】This Audio Extractor's Optical Interface Supports 2.0CH PCM, 5.1CH Dolby Digital, DTS Audio Output, 3.5mm Audio Output Supports 2CH PCM Stereo Audio Only, Comes with 6.6 feet (2m) Optical Cable which is More Convenience to use. 【Aluminum Alloy Shell】Made of Aluminum Alloy Material is Useful To Reduce Signal Loss and Get a Better Output Signal. 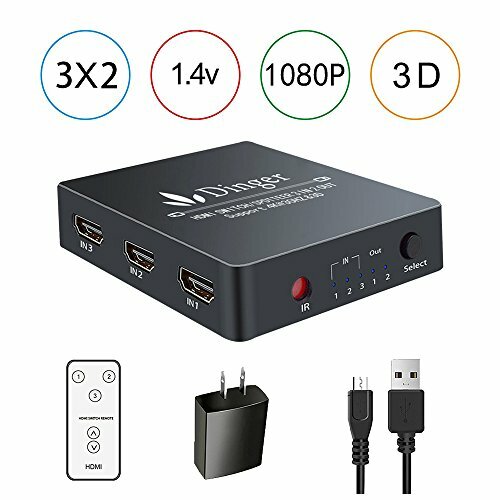 Suitable for various HDMI source devices like Roku or Chromecast without dedicated audio output as well as Blu-ray/ DVD/ HD player, cable/ satellite box, Amazon Fire TV, PS3/4, Apple TV, Xbox, PC/laptop, HD camera, HD DVR. 【Audio Signals Support】The Audio Extractor's Optical Interface Supports 2.0CH PCM, 5.1CH Dolby Digital, DTS Audio Output, 3.5mm Audio Output Supports 2CH PCM Stereo Audio Only, Comes with 6.6 feet (2m) Optical Cable which is More Convenience to use. 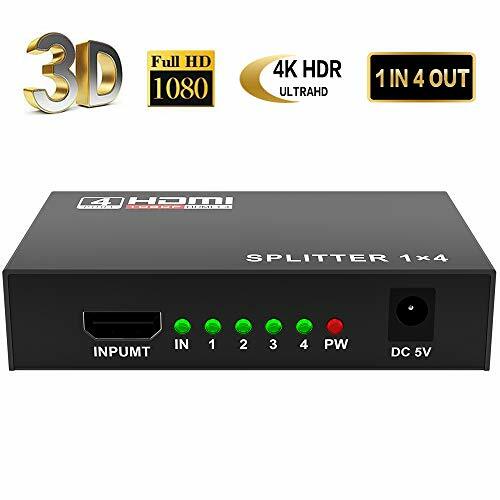 1x4 Hdmi Splitter: Split 1 HDMI input signal to 4 identical HDMI output signals,it can distribute one signal source to 4 hdmi displays or 4 seperate HDTVs simultaneously without any loss in quality. Easy To Use: It is made of tough metal material, you just need a 49ft hdmi cable max length for connecting your devices and enjoying your movies or games,it can offer HD video solution for super market, shopping mall, HDTV, STB, DVD, projector factory, data control center, information distribution, conference room presentation; education and training; corporation show room, home theater, etc. 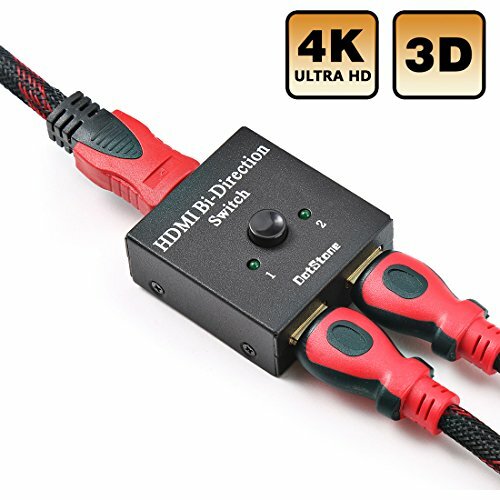 Wide Applicability: 3D support, and hdmi splitters worked perfectly with Nintendo Switch, computer, laptop, PS3 game, Blu-ray DVD, tablet pc, projectors, full HD TVs, etc. This Version 1.4 HDMI Splitter compitable with HDMI 1.4,1.3 and 1.2 version. The hdmi splitter can be applied to different HDMI devices with standard HDMI interface.Input: Computer, XBox 360, XBox One, PS3, Pro, Blu-Ray DVD player, PC, Projectors etc. Output: HD-Ready, Full HsD TVs, Apple TV, Samsung TV, monitors etc. Long Distance Transmission: The 1x4 HDMI splitter provides you an extra long distance for video/audio transmission, which up to 100ft ( Input 40ft, Output 60ft) with the AWG26 HDMI standard cable. Allow you duplicate the screen to different rooms easily. Each splitter unit's output can achieve a long distance transmission of no more than 15 metres, while no worry about signal loss. Technical Details: It supports 4K/2K 1080P and 3D resolutions, it can reach up to 3840x2160/30Hz. Included: 1 x HDMI Splitter, 1 x 5V/1A Power adapter, 1 x User manual and 12-month warranty and friendly customer service. 【1 IN 4 OUT】 HDMI Splitter with 1 hdmi input port and 4 hdmi output ports, It means that it can distribute one signal source to 4 hdmi displays or 4 separate HDTVs simultaneously without any loss in quality. Only make sure that hdmi link devices support hdmi signals. 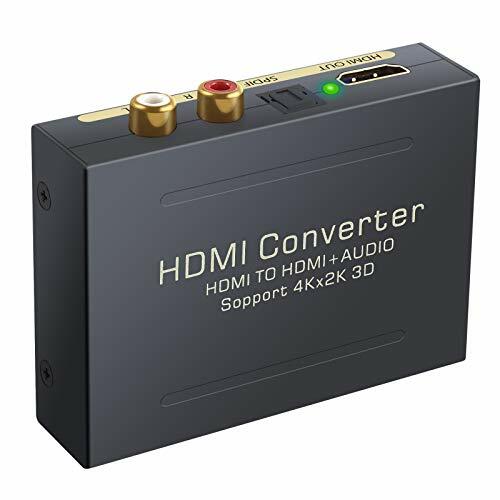 【STRONG COMPABILITY&HD】Support HDMI Format: deep Color 408i/576i/576p/720p/1080i/1080P. 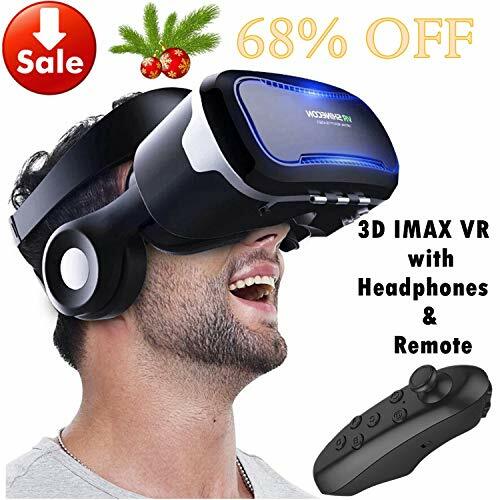 Full HD and support 3D,4K .You can enjoy a very clear images on your screen. Only need 5V power supply, saving energy, and easy to use, only take seconds to install it. 【MENTAL BOX&COOLING FUNCTION】Our HDMI splitter is very small size(3.8''X2.4X0.8'')with a heavy-duty cool metal case which can protect inside parts well and won't be broke easily. Besides, our splitter has cooling function can keep it cool and not get heating after long time use, guarantee it's long service life. 【WHAT CAN YOU GET】 1 X HDMI splitter, 1 X adapter, 1 X manual, 30 X Day Money Back,12 Months Warranty. 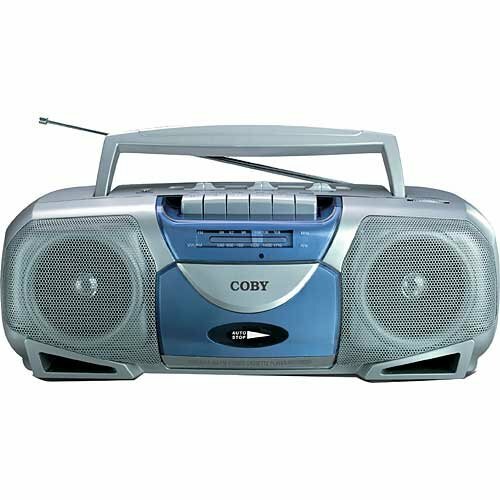 Portable Cassette Player/Recorder with AM/FM Tuner. 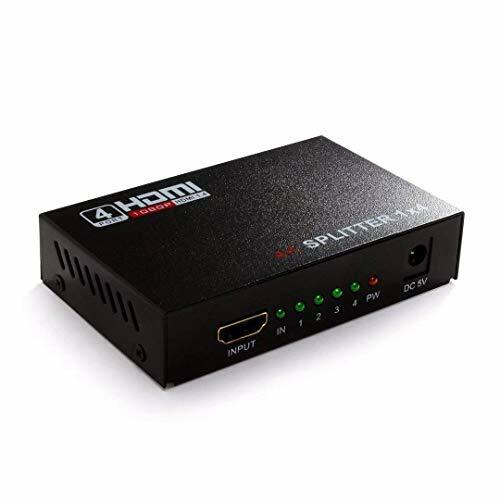 HDMI Amplifier - With built-in automatic adjusting amplifier, the HDMI splitter 4 out 2 in can regenerate the HDMI signal before sending it to the outputs by a long HDMI cable. 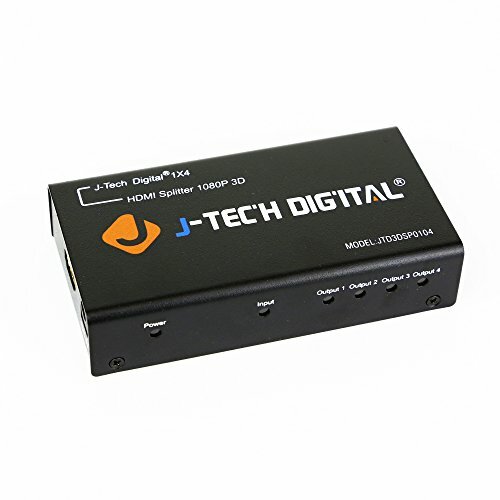 This 2x4 HDMI splitter selector supports single HD display for multiple sources, such as DVD Players and Satellite Receivers, Digital Projectors, A/V Receivers and Set Top Boxes. 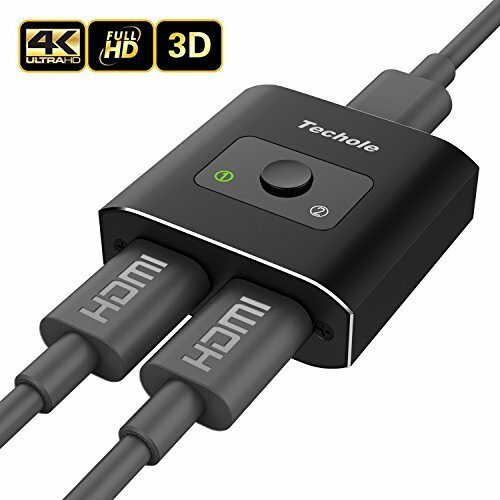 When a HDMI cable connects with HDMI output , the 2x4 switch/splitter can amplify the HDMI signal; Supporting highest video resolution 4K X 2K, 3D, 1080p/60Hz, HDMI1.4a. 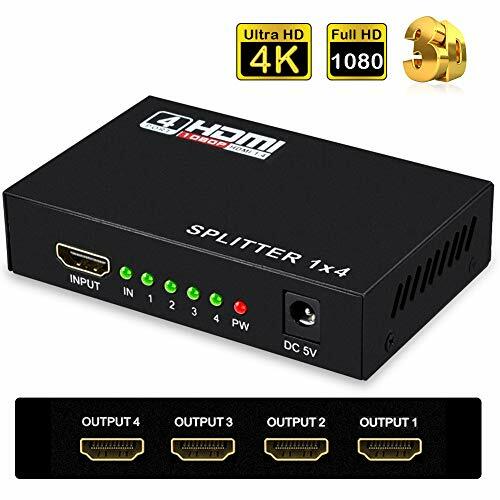 ✅【Expand Your HDMI Capacity】HDMI Splitter 3 in 1 out with High Speed Pigtail Cable, 3 Ports Auto Switcher Hub to Expand Your HDMI Capacity, connect up to 3 HDMI compatible devices for seamless transitions without external power required. ✅【Wide Compatibility】The digital audio transmission signal can be switched on and off with three signals, and the operation is simple. 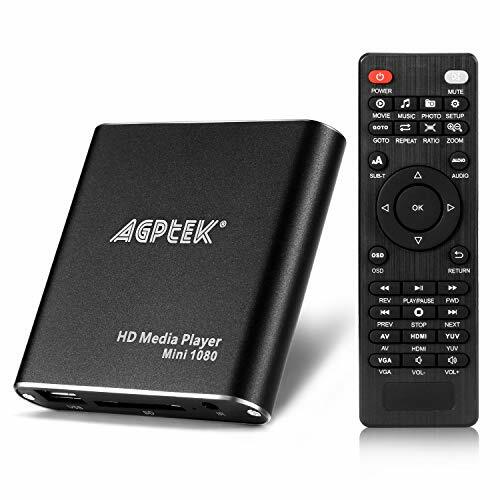 It can be compatible with all kinds of HD video sources. It is also compatible with a variety of HD-DVD formats, set-top boxes, PS3 consoles, and Xbox360 so on. ✅【Easy Operation】HDMI Switch is Easy install & operation. No external Power required. Support HDMI Plug & Play. With a fixed HDMI cable connector, it not only reduces costs, but also saves time for you. 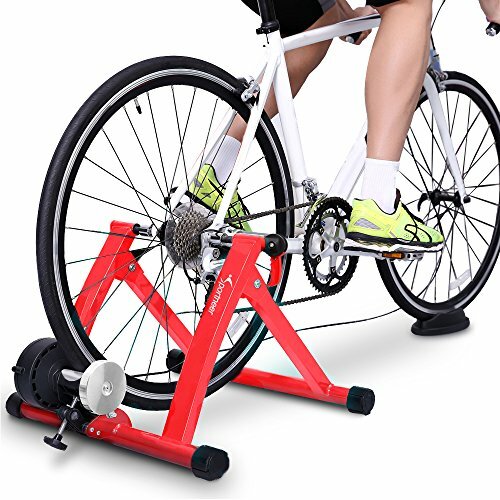 ✅【Customer Guarantee】100% money back guarantee and lifetime warranty. No worries, No Hassles, Friendly customer service and 100% Risk-free purchase. [PLUG AND PLAY] No adapter needed, just simply press the button on the HDMI box to make shift of input or output source. With 2 LED indicators, you can easily tell which connected HDMI device is running. [HIGH RESOLUTION] Support 3D, 1080P, 4K x 2K resolution and HD audio. 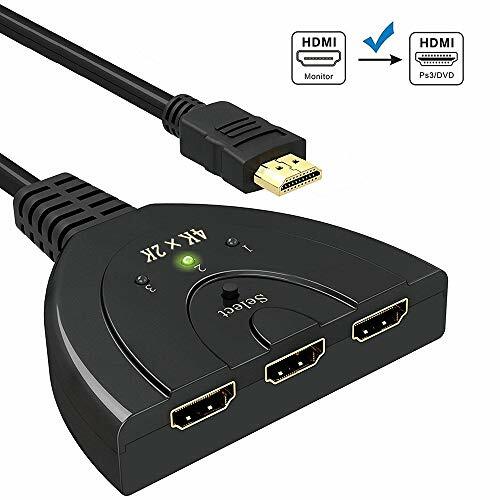 Please use standard HDMI 2.0 Cables to connect your HDMI Source (like XBox, PS4) with Display and HDMI switch, if the resolution of your HDMI Source support 4K (4096*2160) . 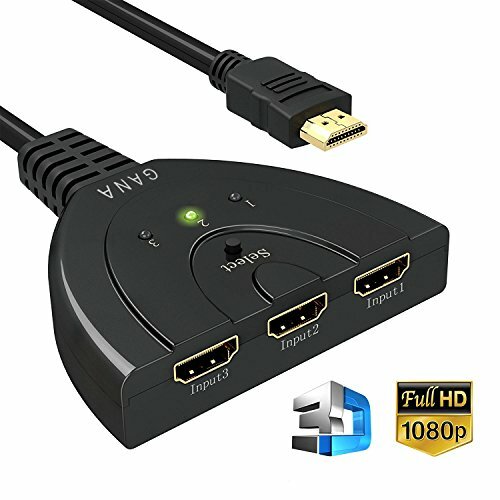 [BROAD COMPATIBILITY] suitable for most devices with standard HDMI interface. Input: computer, XBox 360, XBox One, PS3 / PS4 ,Blu-Ray DVD player etc. Output: HD-Ready or Full HD TVs, monitors, projectors etc. 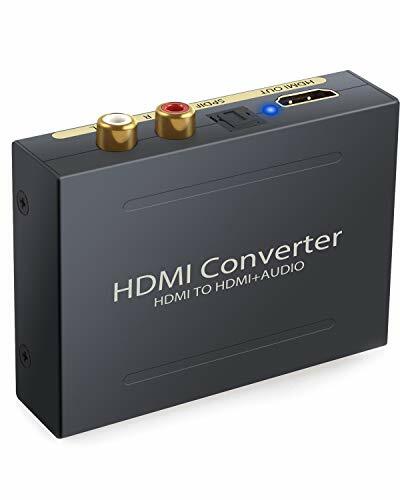 【4K HDMI to HDMI Audio Extractor】HDMI to HDMI + Optical Toslink(SPDIF) + RCA(L/R) Stereo, One HDMI Input Convert to one HDMI + Audio (SPDIF+R/L Audio) Output. 【3 Audio Mode Options】with Pass, 2CH and 5.1CH Three Audio Mode Options, SPDIF Output Supports Pass 2CH PCM, 5.1CH Dolby Digital, DTS (Dolby Digital Plus not Supported); Analog RCA L/R Output Supports 2CH PCM Stereo Audio. 【Gold-plated Connector】Metal Casing Design, Overall Shielding without Signal Interference, Gold Plated Connector, Enhance HD Video Signals. Plug & Play. ONE-SECOND SWITCH: The USB switcher allows two computers or mac to share same peripheral usb devices with 4 USB 3.0 ports. Without the hasslement of plugging and unplugging cables, one key press to switch within one second! FASTER USB 3.0: 4 USB 3.0 ports make the date transfering rate up to 5Gb/s (10 times faster than USB 2.0). With two 1.5m USB 3.0 cables packaged in, the SOHO KVM SWITCH can work well with high-bandwidth USB 3.0 peripheral devices such as external hard disks , HD webcams and digital cameras. It is backward compatible with USB 2.0 and USB 1.1 devices. MORE CONVENIENCE: In office, the PC selector box allows two computers to share same printer and scanner, which could reduce the cost. At home, you could use same keyboard and mouse to control two pcs with one-key switch. PLUG AND PLAY: Easy to install. No extra drivers or softwares required. We provide 1-year warranty and 24-hour email responding! Note: Mechanical Keyboards may make it buzzing. 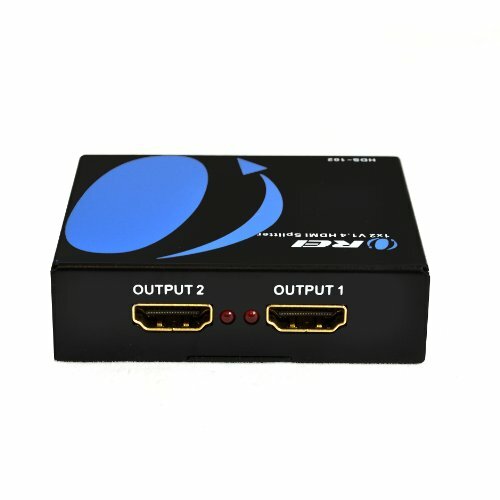 【One Input to Two Outputs】Powered HDMI to Dual Female Splitter distributes audio and video signal from a single source to two different HDMI displays simultaneously without any quality loss. No lag, no flash or drop in resolution. (Note: this dual hdmi splitter not 2 inputs 1 ouput, can't switch 2 signal source to one display). 【High Compability】Keliiyo HDMI Audio Splitter with advanced and strong chip can analyze and process data up to 225MHz. It supports signal bumper and HDCP1.0/1.1/1.2/1.3/1.4. 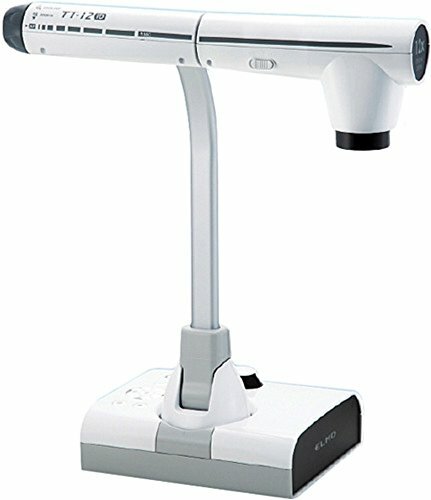 Input: Computer, DVD player, Desktop PC, Gaming console PS3, Projectors etc. Output: HD-Ready, Full HsD TVs, Apple TV, Samsung TV, monitors etc. NOTE: If connect with vga cabel or vga adapers,the vga device need to be powered. 【Crystal Clear Picture】Keliiyo Hdmi Splitter 1X2 supports 720i/720P/1080i/1080P 3D data transfer, just fully enjoy the most luxurious video and audio with your friends or families. This 1X2 hdmi splitter with wired was tested on achieving up to 100ft ( Input 40ft, Output 60ft, with the AWG26 HDMI standard cable) long distance signal transfer through cascade (Note: two screens show same information). 【Material& Install】 Keliiyo hdmi splitter 1 input 2 outputs made of tough mental material, more durable & useful. 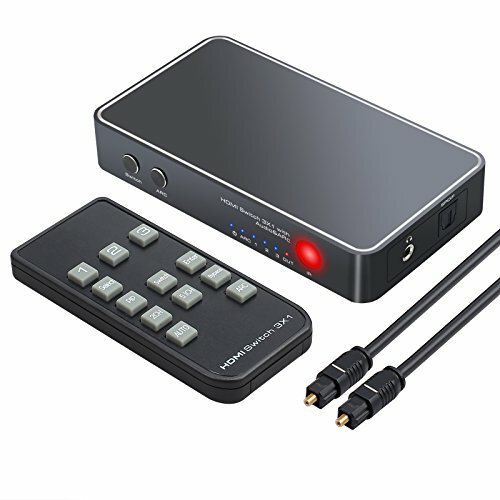 It is easy to use, only take seconds to connect the HDMI input sourse and HDMI output enquipments into HDMI Splitter Box, then enjoying your movies or games. 【NOTE】Please recognize and confirm "sold by KELIIYO", others are fake sellers, they don't provide guarantee and not authorized by KELIIYO. The items they sell are not original and have poor quality. Or they don't deliver after receipt of money. Please do not lose your money. 3 INPUT PORTS: Expand the capabilities of your HDTV, connect up to 3 HDMI compatible devices for seamless transitions. 4K RESOLUTION SUPPORTED - This updated HDMI switch can transmit video of 4K @30Hz, HDCP 1.4 deep color and 3D as well. REMOTE CONTROL - Switch easily between devices by using infrared remote control while sitting in your sofa or lying in bed. WIDE RANGE COMPATIBILITY - with 5V power port and USB power cable(included), Gana HDMI switches are compatible with Nintendo Switch, Blue-ray, PS4, PS3, Xbox, HD-DVD, SKY-STB, Xbo360 and most of the other audio and video devices. 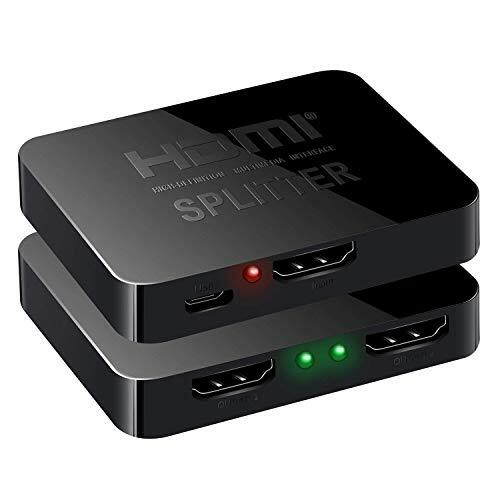 【1X2 HDMI Splitter】 Splits HDMI Display Source to 2 HDMI Display Outputs, One HD Source Input, Two Display on TV at the Same Time without Loss of Quality. 【Support 1080P and 3D】Strong Compatibility, High Resolutions Support up to 1920 x 1200, Including 1080p, 1080i, 720p, 576p and 480p. 【Signal Lossless and Support HDCP 1.3】Achieve up to 15m Long Distance Signal Transfer via Cascade, No Worry about Signal Loss; Powered HDMi to Dual Splitter with Advanced and Strong Chip, Supports Signal Bumper and HDCP. 【Wide Compatibility】Compatible with Most HDMI Devices: HDTV, Projector, Monitor, Laptop etc, Perfect for 3D HDTV/ SKY HD / PS3 / Xbox 360 Elite / Virgin + / Blu-ray player / DVD / HD Camcorder / HTPC / Laptop /Free satellite HD etc. 【Plug and Play】Easy Operation, what You Need is a HDMI Splitter Cable and Connect it to Your Devices, then You can Enjoy Your TV Shows and Movies on Different Display. 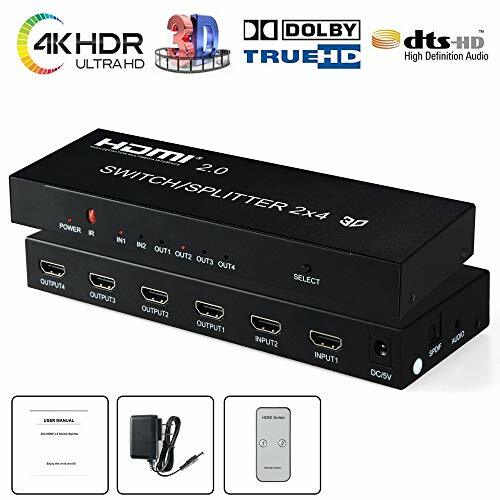 【4 way Hdmi Splitter】Split 1 HDMI input signal to 4 identical HDMI output signals,it can distribute one signal source to 4 hdmi displays or 4 seperate HDTVs simultaneously without any loss in quality. 【Note: 】This is 1 in 4 out HDMI splitter, not 4 in 1 out HDMI switcher, can not switch 4 singal source to 1 display. 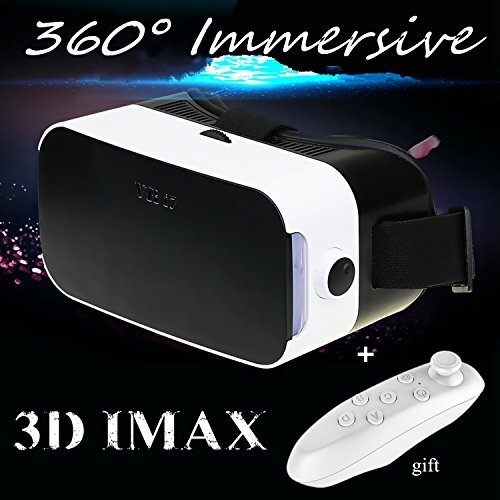 【Technical Details】It supports 4K@30Hz, 1080P@30Hz, 1080P@60Hz and 3D resolutions, reach up to 3840x2160/30Hz, worked perfectly with Nintendo Switch, computer, laptop, PS3 game, Blu-ray DVD, tablet pc, projectors, full HD TVs, etc. 【Widespread Use】Offer HD video solution for super market, shopping mall, HDTV, STB, DVD, projector factory, data control center, information distribution, conference room presentation; education and training; corporation show room, home theater, etc. 【Included & warranty】1 x HDMI Splitter, 1 x 5V/1A Power adapter, 1 x User manual and 12-month warranty , if you have any question, please feel free to contact us. 【METAL BOX&COOLING FUNCTION】Our HDMI splitter is very small size(3.8''X2.4X0.8'')with a heavy-duty cool metal case which can protect inside parts well and won't be broke easily. Besides, our splitter has cooling function can keep it cool and not get heating after long time use, guarantee it's long service life. 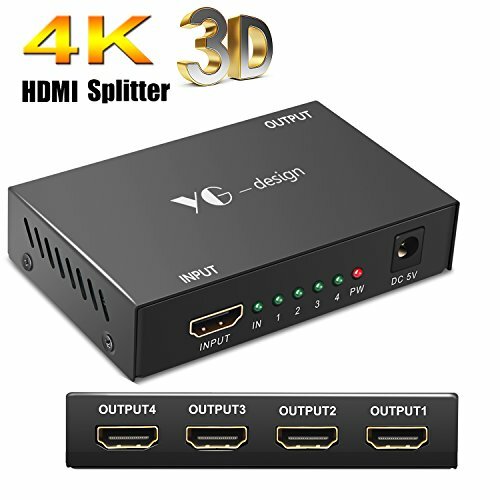 ★★★★★【WHAT CAN YOU GET】 1 X Yuangao HDMI splitter, 1 X adapter, 1 X manual, 30 X Day Money Back,12X Month Warranty. If you have any questions, please feel free to contact us. PLUG AND PLAY: This HDMI switch is easy to setup and operate. No external power supply needed, just connect your HDMI devices to enjoy! Simple press of a button to swap signal within one second, and the LED light tells you which port is active. 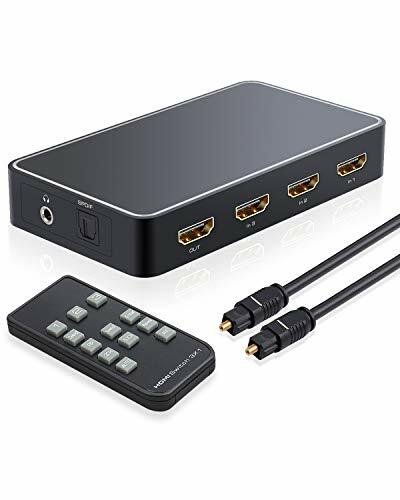 UPGRADED HDMI SWITCH: Solid Aluminum Alloy construction, Techole durable HDMI bi-directional splitter help you connect two HDMI sources to one HDMI display, or connect one HDMI source to toggle between two displays (two screens CANNOT display simultaneously). 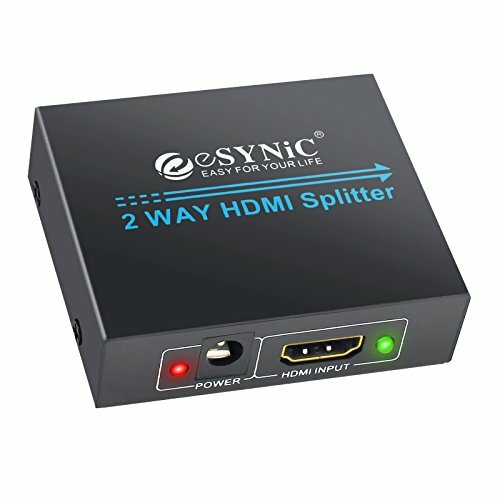 COMPATIBILITY: HDMI Splitter Switcher suitable for most devices with standard HDMI interface. Input: computer, XBox 360, XBox One, PS3 / PS4, Blu-Ray DVD player, Route Roku, Chromecast, PC etc. Output: HD-Ready, Full HD TVs, Apple TV, monitors, projectors etc. 2 Port HDMI splitter compatible with Xbox One, Cable Box, 4K TV, Projector, HDMI LCD, DVB receiver, TFT monitor, Blu-Ray, DVD or HD-DVD players etc. 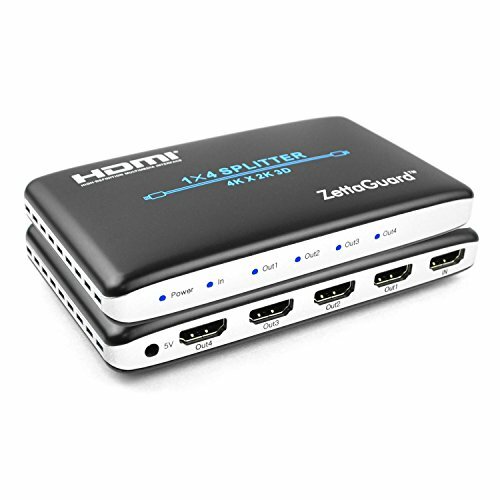 *3-PORT HDMI SWITCH - 3 HDMI ports in and 1 HDMI out for various HDMI devices. 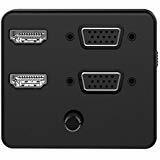 3 HDMI source devices to be connected and manually selected to play, to avoid constantly plugging and unplugging. *PLUG AND PLAY - No extra power required. The HDMI switch will obtain power automatically from the source devices through the HDMI ports. NOTE: for only some devices, when their HDMI port can not provide sufficient power for this switch to work. You need to connect three source devices to the input ports. 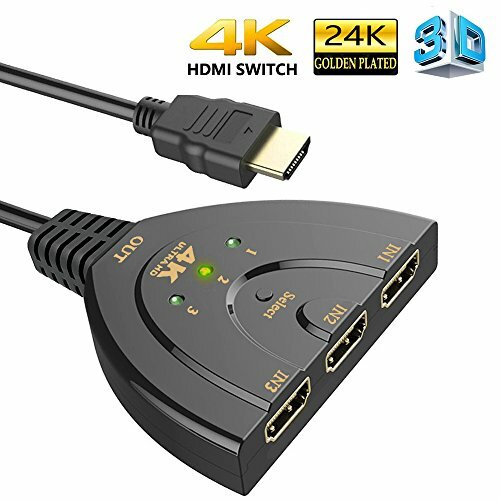 *GOLD PLATED HDMI INPUT AND OUTPUT - 24k gold plated connector resist corrosion, reduce tarnish and increase transmission performance. 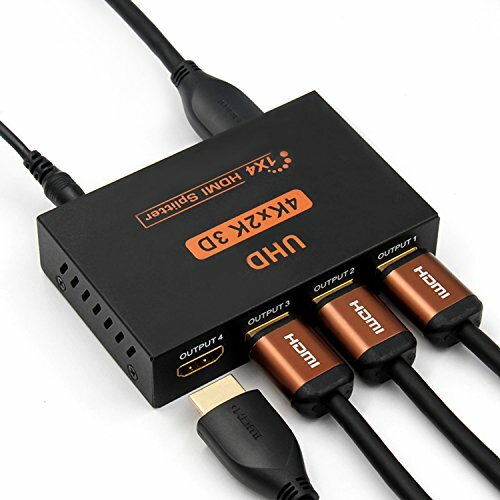 【1x4 Hdmi Splitter】Split 1 HDMI input signal to 4 identical HDMI output signals,transmit video and audio simultaneously without any quality loss. Make sure that hdmi link devices support hdmi signals. 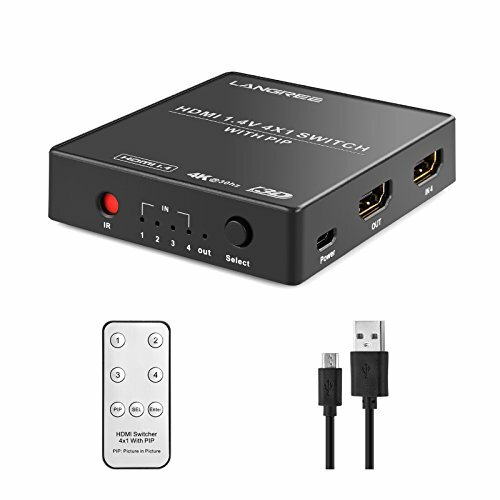 <b>Note</b>: NOT hdmi splitter 4 input 1 output, can't switch 4 signal source to one display. 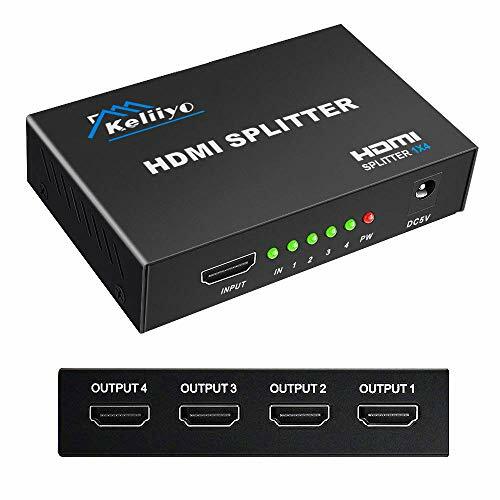 【High Compability】Keliiyo Hdmi Splitter 1 in 4 out supports full HD 1080P and 3D resolutions, it can reach up to 3840x2160/30Hz, deep Color 408i/576i/576p/720p/1080i/1080P, worked perfectly with Nintendo Switch, computer, laptop, PS3 game, Blu-ray DVD, tablet pc, projectors, full HD TVs, etc. 【Wide Application】3D support, HDCP V1.4 Powered hdmi splitters 4 port can use for shopping mall super market, data control center, information distribution, HDTV, STB, DVD, projector factory, corporation show room; home theater, education and training; conference room presentation. 【Material& Install】Keliiyo hdmi audio splitter made of tough mental material,more durable & useful. 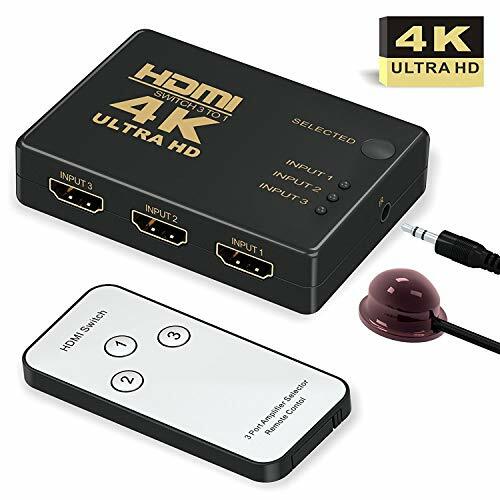 It is easy to use, only take seconds to connect the HDMI input source and HDMI output enquipments into HDMI Splitter Box, then enjoying your movies or games (49ft hdmi cable max length). 【Note& Warranty】We provide 100% satisfaction and lifetime guarantee. Any problem or dissatisfaction, pls feel free to tell us at the first time, we will reply you within 12 hours and REFUND FULL or FREE REPLACEMENT without question ask. You derserve the best product and service !!! PLUG & PLAY: HDMI selector switch is easy to operate, No external power required, everything just plug and play. Simply swap between HDMI signals with one single press on the button and check its working status with 2 indicator lights. 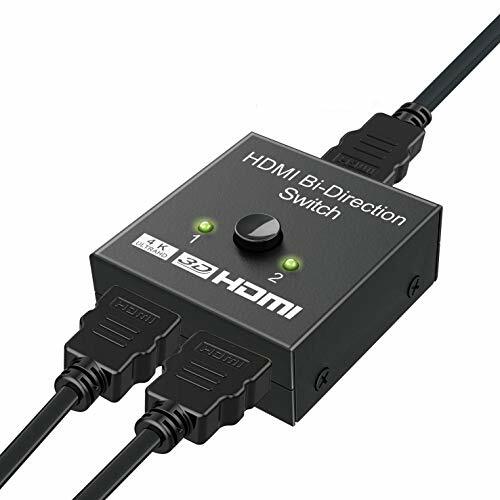 WIDE COMPATIBILITY: HDMI switcher 2 ports can work with most devices with standard HDMI interface. Input: PCs, Xbox 360, PS3/PS4, Roku Express, Amazon Fire TV Stick, Blu-ray DVD, etc; Output: Full HD TVs, projectors, monitors and more. PROFESSIONAL & RELIABLE: Our company is a certified HDMI Adopter of HDMI Association, splitter hdmi switch holds FCC, ROHS and EMC certifications. We as trustworthy seller will provide 100% worry-free 18-month guarantee and friendly customer service for all our customer. 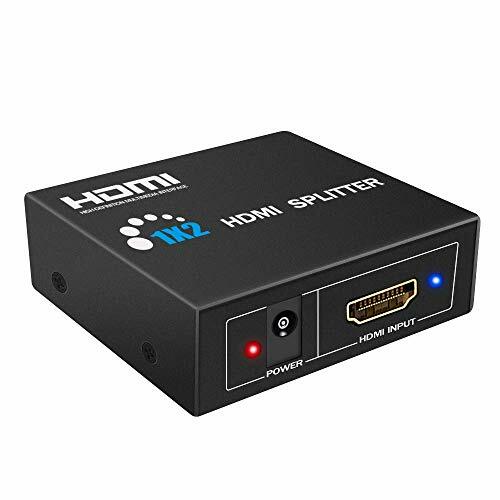 【HDMI Splitter 1 in 2 out】Split 1 HDMI input signal to 2 identical HDMI output signals. Distributes audio and video signal simultaneously without any quality loss. 【Digital Audio Format】Support DTS-HD/Dolby-trueHD/LPCM7.1/DTS/Dolby-AC3/DSD/HD. Support Deep Color 30bit, 36bit, Blue-ray 24/50/60fs/XvYCc . 【High Quality Design】Aluminum alloy Shell and 24K gold-plated interface Offers Ultra HD Resolution. 【Plug and Play 】Easy to Use and Operate. No More Drivers Needed. 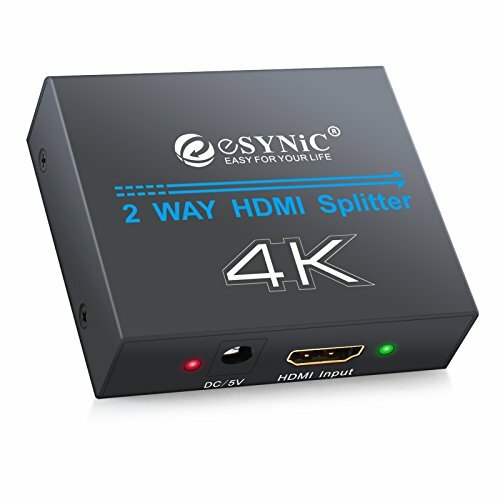 You just Need to Connect it Correctly and You Can Start the HD Video and No Loss of Audio Enjoyment. This USB Switch 4 Port device allows up to 2 users to share 4 USB 3.0 peripheral devices, such as printer,scanner,mouse,keyboard or usb disk etc without the need to constantly swap cables or set up complicated network sharing software. It's a great for use at home if you have multiple PCs or Macs. 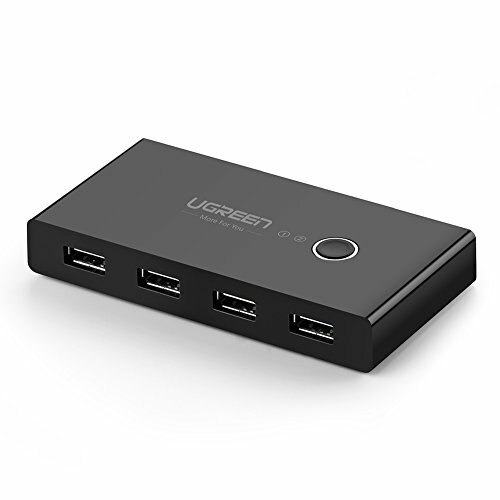 USB 3.0 Switch supports ultra-fast USB 3.0 data transfer rates of up to 5Gb/s (10 times faster than USB 2.0), to work flawlessly with high-bandwidth USB 3.0 devices, such as external hard disks, high resolution webcams, camcorders, video surveillance cameras, digital video cameras, multi-channel audio and more, and is backward compatible with USB 2.0 and USB 1.1 devices. The USB sharing switch allows you combine with 4 USB 3.0 Ports to share multiple devices e.g. printers, scanners, etc. Bus powered with no external power supply required. Button and LED design,you can easily switches between systems via push buttons with LED indicating the active computer. 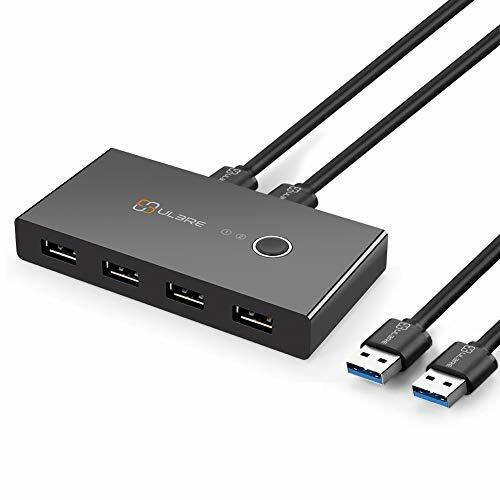 STABLE Connection: USB 3.0 sharing switch with a separate micro usb female port for option power,which optimizing its compatibility with more devices, such as HDD,Digital Video Cameras, SSD etc. Important Note: Please use Standard 5V Adapter(Not Included, sold separately) for powering. Any charger with higher voltage output is NOT allowed and may affect the product performance. 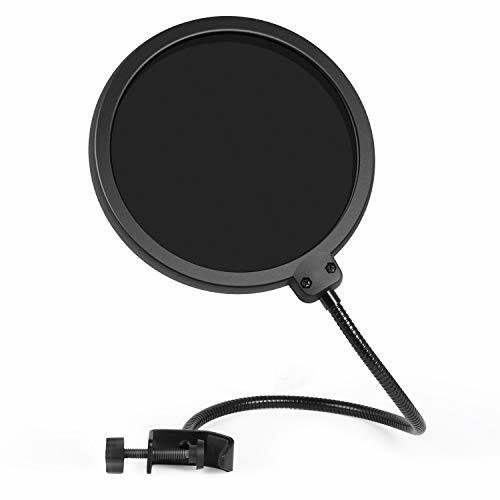 Two-screen Pop Filters: The first screen blocks air blasts as any pop filter normally would; The gap in between then disperses any remaining air pressure, so by the time it passes the second screen, the blast is easily contained. Adjustable Gooseneck: The metal gooseneck holder fully supports the filter's weight and keep it in place. You can adjust the angle and distance between the screen and the microphone. Application: Banish the dreaded hissing and lisping sounds that come when pronouncing the letter "S" and blocks those ugly "plosives" that follows "B" and "P". It is a great item for singers and actors alike who want help achieving the best possible performance and help protect the spitting all over your vocal mic.Its dual layer and tighter mesh allowing it to actually stop plosives. Put your hand behind it and make the P-sound and you won't feel any air come through. Easy Mount & Demount: Swivel mount for easy installation. InnoGear Microphone, Mic Stand and Shock Mount are sold separately, NOT included.